Rolling Hero has actually been around in the form of a Flash game for some time now. It’s the sort of game that fits Chillingo’s style quite well. 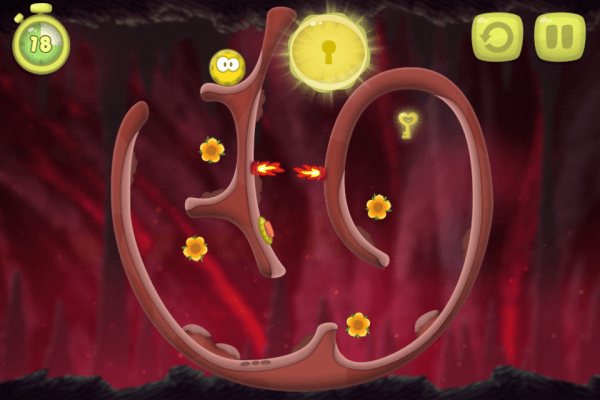 The game is comprised of short, quick levels with more to go back to once you finish it, should you choose. So how well does Rolling Hero make the jump from Flash to iOS game? Will he roll into the annals of history as a legend, or should he be bowled into a ravine? Let’s find out. Rolling Hero has a story, but it serves as nothing more than a device to give some semblance of setting. Redman, a large, angry, spike-covered chap kidnaps the hero’s girlfriend and it’s our duty to go get her back. It’s a worn path, but that’s ok. Rolling Hero doesn’t really need a story anyway. Rolling Hero‘s gameplay is fairly straightforward. When you press on a side of the screen, the world will rotate in that direction. Gravity will then send our protagonist rolling away with the slope you’ve just created. The interesting thing about tilting the screen is that getting through all of the stages will require you to maneuver the hero using these mechanics, often ending up with some crazy results. There are five worlds in Rolling Hero, including one that will require some extra diligence to unlock. Each world contains a dozen levels. Each level is sort of its own unique contained gravitational field. Should you fly off it going one direction, there’s a chance you can use gravity and the rotation mechanic to pull the hero back onto solid ground. It makes for some wacky moments that can be pretty fun, though ultimately it never really presents any challenge. 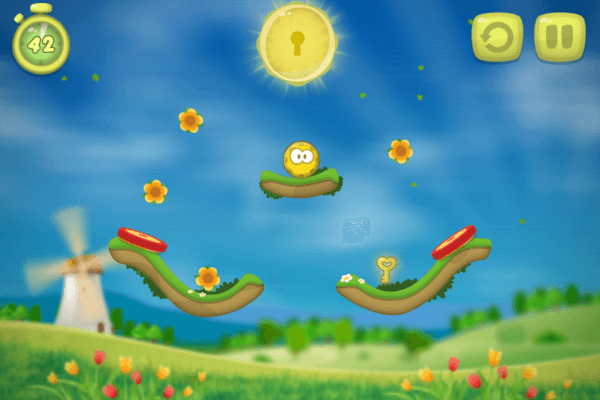 Each level will contain an exit, oftentimes a key you must work to attain, and flowers scattered throughout the level. 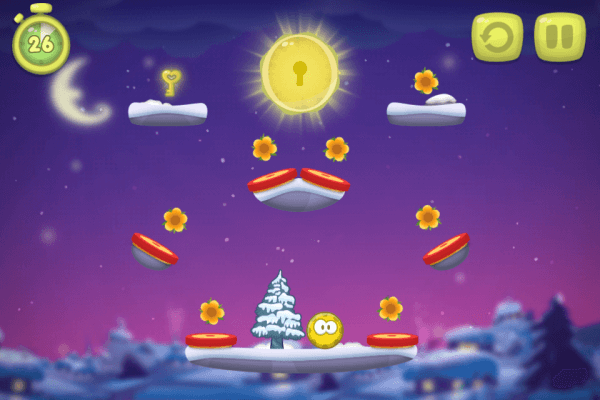 You’re ultimately scored for each level based on how quickly you can finish the level and you’re given bonus points for each flower you collect, with a big boost coming your way if you get every flower on a level. Once you work through the game, these flowers will help extend the life of the game, since it will be going back to get these little collectibles that really drives you to figure out each level. Levels generally take no more than 15-30 seconds to work through if all you’re trying to do is getting the key and get out of dodge, even with enemies and traps placed around the level. As previously mentioned, ensuring you get each flower will add a little more playtime to the game, but this will ultimately be sort of game that’s a perfect fit for someone looking to burn a minute or two in line at the supermarket. Rolling Hero has the same sort of visual feel as several other titles published by Chillingo. Cut the Rope most immediately comes to mind. A soft color palette and cutesy cartoon-like visuals welcome players as you set out to save your lady from Redman. Even the spikes and fire traps feel like they’re coated in a harmless layer of charm. It will really draw you in and make you feel all warm and fuzzy. The audio in Rolling Hero fits right alongside the visuals. Tunes are light, mellow, and inviting, yet each world’s theme has a feel appropriately unique for it. Sound effects are amusing as well. Listening to the hero give a little sigh and an unseen crowd give a sympathetic “awww” when time runs out or you pop helps add even more charm to the game. Overall, Rolling Hero is a good game. 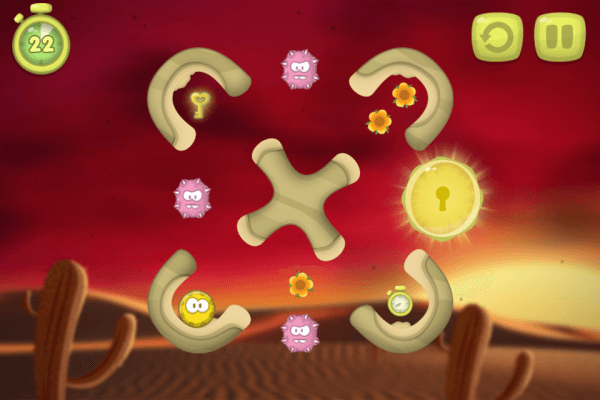 It doesn’t really do anything that breaks new ground, but the variety of the puzzles in the level and the collecting mechanics add welcome value to the game. Wrap all of that in a layer of adorableness set to match a kitten playing with a ball of yarn and you’ve got a package that anyone in the family can enjoy.